Where would we be without bats? There are 90 species of bats in Australia, some can eat their own body weight in insects in a single night, others pollinate flowering and fruiting plants, and yet most of us know very little about our amazing little neighbours. * The skin forming the surface of a bat’s wing is an extension of the skin of the abdomen that runs to the tip of each digit, uniting the forelimb with the body. * All bats belong to the order Chiroptera, which means ‘hand-wing’ and is pronounced ‘Ki-rop-tera’. * There are two broad categories of bats: Microchiroptera, also known as microbats; and Megachiroptera, also known as megabats, fruit bats, blossom bats and flying foxes. * The largest bat in Australia is the Black Flying Fox (Pteropus alecto), which lives along the northern coast of Australia, can grow to 19cm in length and weighs almost a kilo. 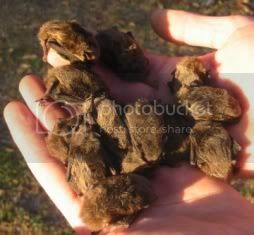 * The smallest bats in Australia are the Little Forest Bat (Vespadelus vulturnus) and the Northern Pipistrelle (Pipistrellus westralis) – adults of these species can weigh less than 4g! * Megabats, also known as fruit bats or blossom bats, eat fruits, nectar, pollen, bark and leaves – no need for echolocation, they find their food using their excellent senses of sight and smell. * Some megabats can pollinate trees over 50km from their roost site in a single night’s foraging. * Microbat calls range in frequency from 14,000 Hz to well over 100,000 Hz, well outside the range of human hearing! * The White-striped Mastiff Bat (Tadarida australis), also known as the White-striped Free-tail Bat, is one of only a few bat species in the world whose echolocation calls can be heard with unassisted human hearing. It may be found across much of Australia, including the Murrumbidgee catchment. * Microbats hunt insects using echolocation - far more accurate than any human SONAR, they can pinpoint insects less than 1 mm in size! Every child learns that bats live in caves, but there aren’t many caves in the Murrumbidgee catchment, or much of Australia, so where do all our bats live? Where caves are available, local bat populations will utilise them, but they are far from the only places bats may be found. Most Australian bats roost in trees during the day, either amongst the vegetation, under loose and flaky bark, or inside cosy hollows. Other popular roosting sites are within human-built structures: inside roof-spaces, empty rooms with access to outdoors, dark shed corners, concrete drains, under loose sheets of tin, even inside cracks in gate posts! Bats will often roost together in groups or colonies, with some colonies consisting of hundreds or even thousands of bats, if the conditions are right. Maternity sites in particular will often house many individuals, as sites suitable for birthing and raising baby bats are hard to come by, and there is both warmth and safety in numbers. Of the ninety species of bats found in Australia three are listed as critically endangered on a national level under the Environment Protection and Biodiversity Conservation Act (1999), two as endangered and five as vulnerable. Many more species of bats are threatened on a state-by-state or regional scale, and there are several places in Australia where certain bat species have become locally extinct. One species of Australian bat is known to have become completely extinct since European settlement, and it’s possible there may be more. There are many things we as individuals can do to protect our batty neighbours. The most important action is to protect and rehabilitate existing bat habitat and food sources. Retain living and dead trees with hollows in them, as well as trees with flaky or fissured bark. Protect or plant local native flowering shrubs and trees and limit your usage of insecticides – remember: bats are natural pest control! Reduce threats to bat populations. Cats can climb trees and attack roosting bats – keep your cats indoors or in enclosed runs, capture and remove feral cats, or take steps to prevent local cats from climbing trees or accessing other known bat roosting sites in your area. Shooting and poisoning of bats also occurs in some areas, particularly fruit-growing regions where bats can be a threat to fruit crops – net your fruit trees or use other non-lethal bat-exclusion techniques to protect your crop without harming your neighbours. Provide alternative housing. Tree hollows are in high demand as wildlife real-estate, form very slowly and are increasingly rare across much of the country. If your local area is lacking in homes for bats, you can help out by providing temporary housing to fill the gap in the form of nesting boxes designed specifically for bats. You can find more information on bat nesting boxes from the Organisation for Bat Conservation and FauNature. Check out these great bat sites!